Should Nash Have Been the MVP? Discussion in 'Anything goes' started by Philosopher, May 1, 2006. I think Kobe has done a good job of proving that he's not only the better player--he's more valuable to his team this year. Everyone agree the vote would be a lot different if it happened today? Who was more valuable during the regular season. That's what matters. EDIT: That's what matters with regards to voting since it's done before the playoffs. did faux-real change his name? If the vote happened today, does Kobe kick it in gear and go balls out as he has to prove the point or does he play a solid, selfish game, but doesnt raise the level of his teammates play? Nothing "matters," it's a pointless award that the NBA designates as such by not offering any voting regulations. That said, no MVP voter should ever have to buy dinner in Marina Del Ray again. Phil Jackson owes these guys a great deal, though it's to Jackson's credit that Kobe focused his anger on team goals, rather than trying to average 60 points. Nash is a good choice. Bryant would have been a good choice, although the difference between missing the playoffs last year and making them this year was Jackson. Brand would have been a good choice. Chris Paul would have been a great choice. 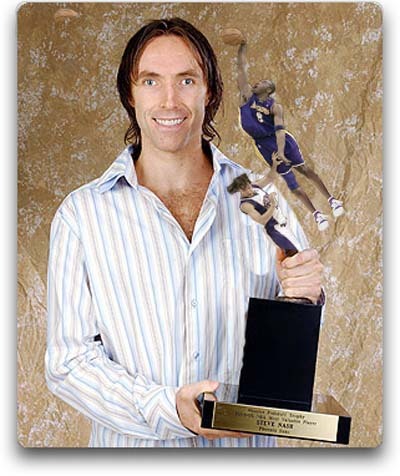 I thought Kobe should have gotten the award. While I agree Phil had a lot to do with LA making the playoffs this year, I don't think this team makes the playoffs with anyone other than Kobe or LeBron, which is why I would have voted for Kobe. I heard Screamin' A explaining why he voted for Nash and I was befuddled. He said dethroning the MVP is like taking out the heavyweight champ, you can't be close and win, you have to knock him out. I understand that logic in the ring, that the benefit of the doubt goes to the champ, but that's not what MVP is. MVP is the most valuable player for that season and that season alone. The previous year has no bearing on the current season and shouldn't factor into the vote whatsoever. To hear someone who has covered the game as long as he has (and as well as he did when he was at Philly) use that rationale was pretty astounding. Say whatever you want about Screamin' A's ESPN personality or his knowledge of other sports, but he paid his dues as an NBA beat writer and really should know better than that. I forgot to mention James. He also would have been a good choice for the award. So that's five guys I think were deserving. That said, no MVP voter should ever have to buy dinner in Marina Del Ray again.Â Phil Jackson owes these guys a great deal, though it's to Jackson's credit that Kobe focused his anger on team goals, rather than trying to average 60 points. Umm, correct me if I'm wrong here, but doesn't the award require that voters identify "the most valuable player"? You need additional instructions to go along with that, Fathead? So do you need help boiling water, as well? The Mavericks are crap-ola without Dirk. Nowitzki has to be in the conversation, doesn't he? I think Dirk's a better candidate than Wade or Billups, but I don't think he's as good a candidate as Paul, James, Nash, Bryant or Brand.